Consider these headlines about Canada, both published this week. First the world view of Canada, reaffirmed at Davos. That’s where Canada comes in. It is a real-world, real-time example of a banking system in a medium-sized, advanced capitalist economy that worked. Understanding why the Canadian system survived could be a key to making the rest of the west equally robust. Next a Canadian view, that says Canada is a bubble waiting to burst, that is not widely shared other than by yours truly. It seems we have learned nothing from the American debt crisis; and here in Ontario, we have forgotten the housing collapse of the early 1980’s, when house prices dropped as much as 40 % and did not recover their old values until after the turn of the century. Speculation was rife; people kept moving up, sometimes changing homes every one or two years; speculators were “flipping” homes, and ordinary people were buying forward several months and expecting their old home to appreciate before putting it up for sale. It worked for a while, but then the market turned, and some people who had committed to a new home and waiting to sell their own at higher prices had to sell much lower and ending up with a new house but a much larger mortgage. Some seniors, selling their old, large home and hoping to move into a new, smaller home, mortgage free, ended up with a smaller home with a large mortgage. Quit claims were rampant. For the rest of the world what is happening in Canada is that home prices rose through the recession, and continue to rise. Extraordinarily low interest rates are incenting people to borrow against equity or purchase a more expensive home than they might otherwise. The reset point for Canada will be when interest rates begin to rise. Analysts from Bank of Canada conducted an analysis of Canadian debt from a historical perspective to 2005 recently. 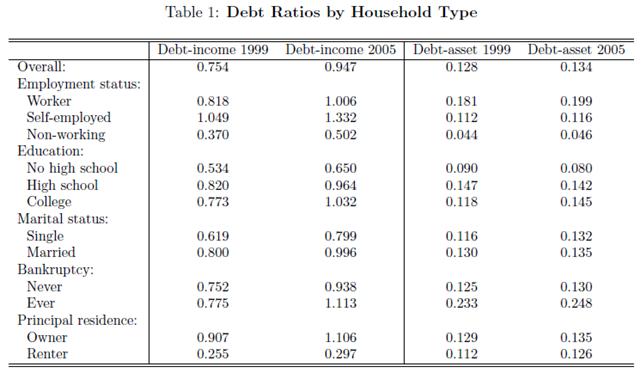 In a nutshell Canadian debt was significant amongst certain groups as early as 2005. More recently Bank of Canada conducted a sensitivity analysis that noted risk associated with defaults if Canadian interest rates rise to the 4 – 5% range, and that would precipitate significant defaults and loss of capital at Canadian Banks. The most telling statement in the Macleans piece is this is that ‘you never see a crisis coming’. As recently as 2009 Scotiabank published a piece entitled “Canada’s Mortgage Market is not like the US”. I believe they are wrong. Time for some economists to read “This Time is Different – Eight Centuries of Financial Folly”. As you can imagine the conclusion of the book, is that it is never different.